Posted by cath in desserts, easy, fruit, Recipes. This is a really quick Raspberry Pavlova you can also eat throughout the winter…all you need is meringues, frozen local raspberries and a tub of double cream. 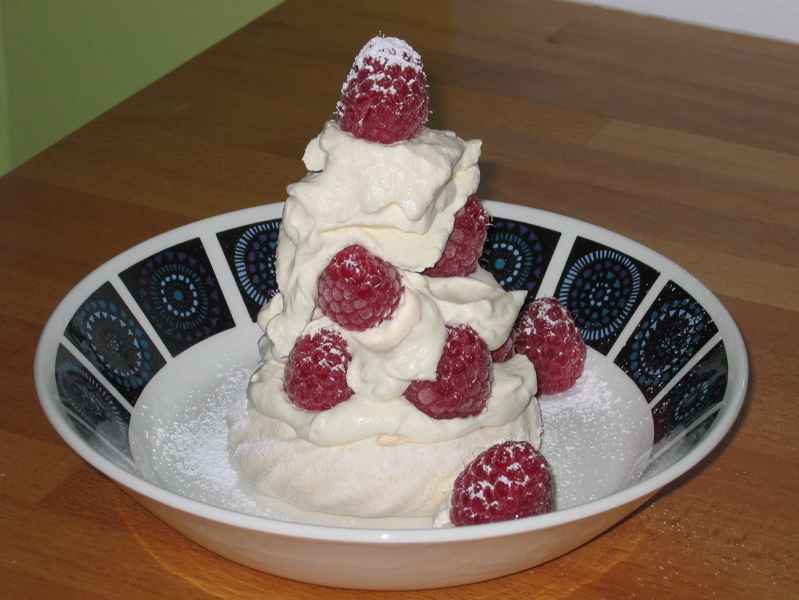 I like M&S meringues, they use free range egg whites and they are the best bought meringues I’ve tasted. You can make this dessert in the summer with fresh summer soft fruits such as strawberries, raspberries, blueberries etc. But it’s winter now, and I don’t think buying imported strawberries etc. is worthwhile – especially when you’ve got a supply of frozen raspberries. I buy mine from the Strawberry Shop at the farmers market here in Edinburgh. 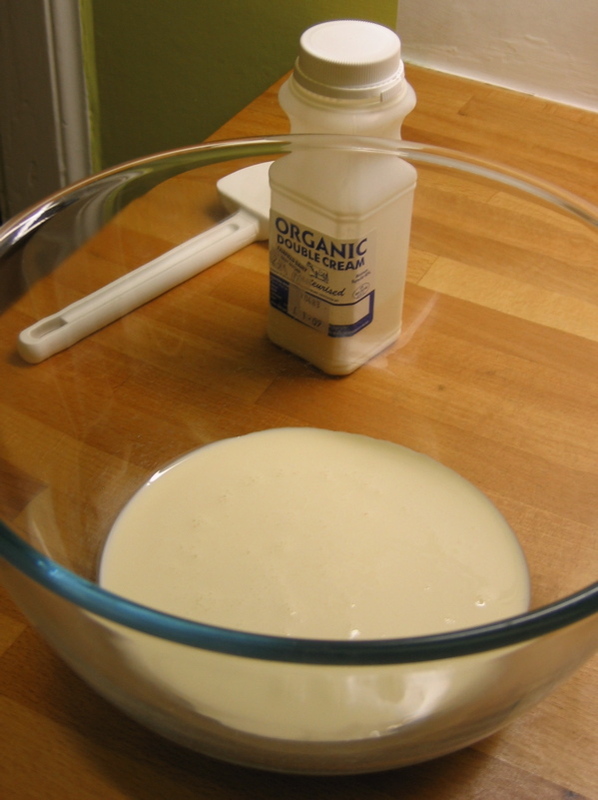 Pour the cream into a large bowl (see picture below). Using a whisk (electric assistance is good for large quanities) carefully whip the cream until it holds a peak (see note below for tips). Now you can build the pavlova. On each plate place a meringue, top with a spoon of cream, then top with half the raspberries. Continue to add a spoon of cream, then a few raspberries in layers until you run out. 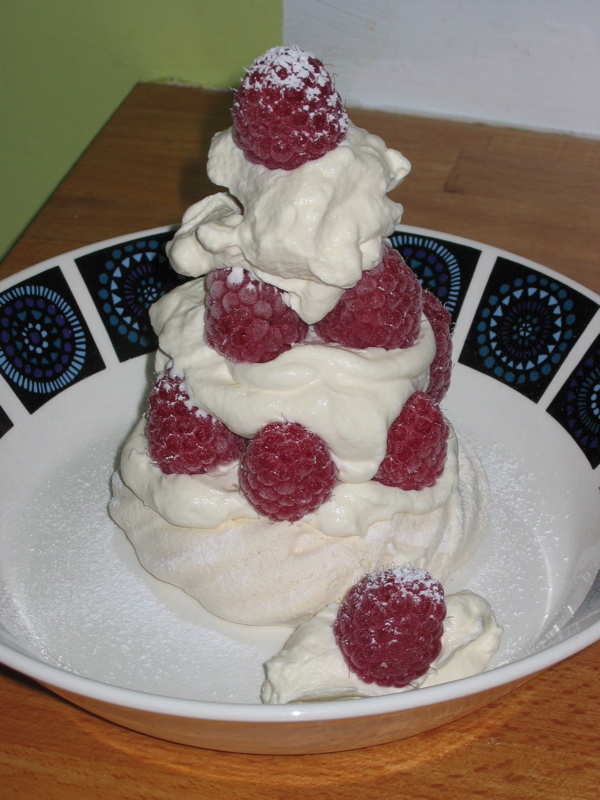 You can either go high, piling each layer on top of the last, or sprinkle more rasperries around the meringue. For extra indulgence you could make a sandwich with an extra meringe on top. Finish with a rasperry on top. For an extra sweet, snowy finish, sieve half a teaspoon or so of icing sugar all over the top. Use a large bowl, you can get a better whipping action and won’t splash as much. It will take a while before you start to notice the cream thickening, especially if whisking by hand, but it will happen – just persevere! 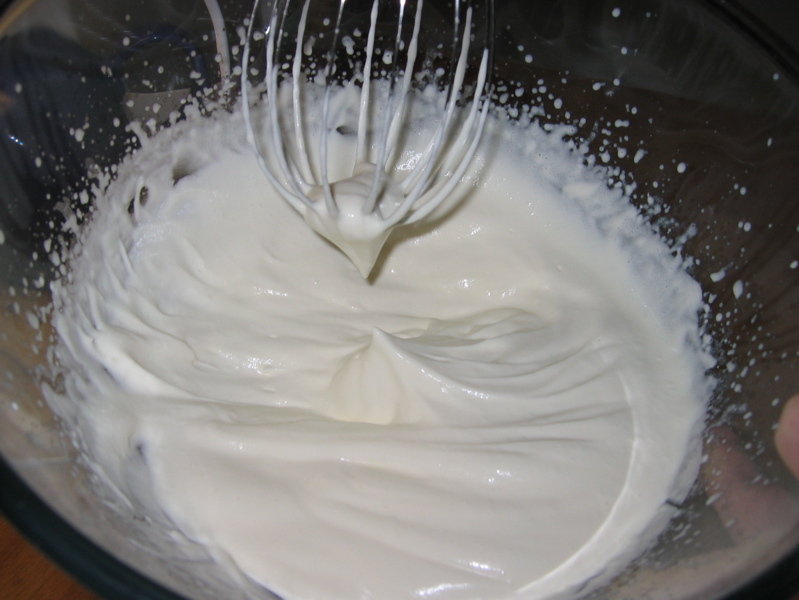 When you notice the cream starting to thicken be careful not to overwhip – the best way to do this (especially when using electric whisks) is to stop now and then and try to form a peak with the cream. Once you start to get some very soft peaks (they will fall back down quickly if soft), only whisk without electrical help. 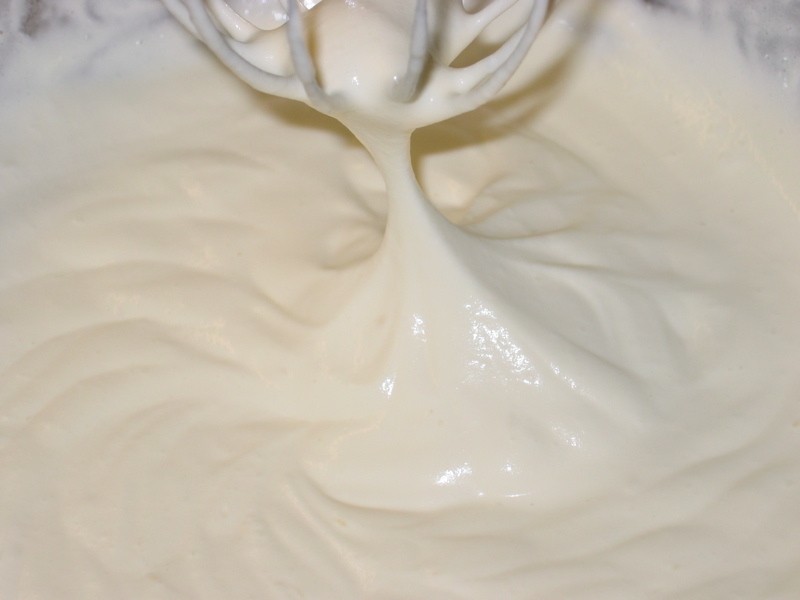 With a few extra turns of the whisk, you should notice the cream thickening quickly and you’ll soon get a soft yet thick cream. Once it holds a peak – stop whisking. Posted by cath in cakes and treats, desserts, easy, fruit, Info and Cooks Notes, ingredients, shopping notes. Yesterday we had fresh strawberries (Scottish) from the Farmers Market, and to be extra bad we were dipping them in my home-made vanilla caster sugar. The vanilla sugar worked really well with the strawberries…so tick another reason why you should go buy some fairtrade vanilla pods from Barts Spices or Ndali. If you’re still buying strawberries at the supermarket – stop! 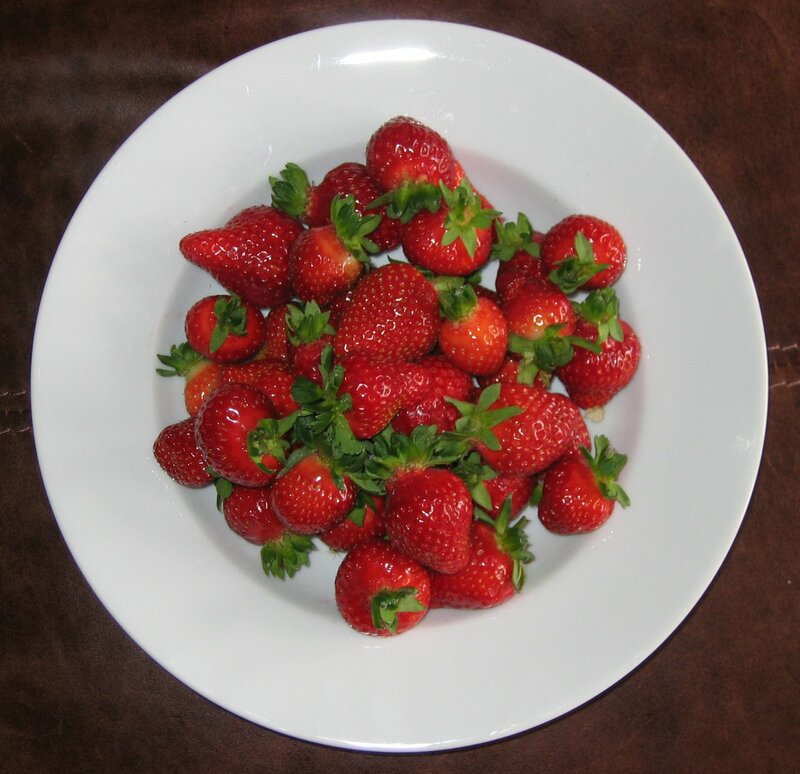 These fresh strawberries from the market were much juicier and sweeter, and had a better bite to them than the imported stuff, or strawberries that have simply been travelling and kicking around too much in depots. 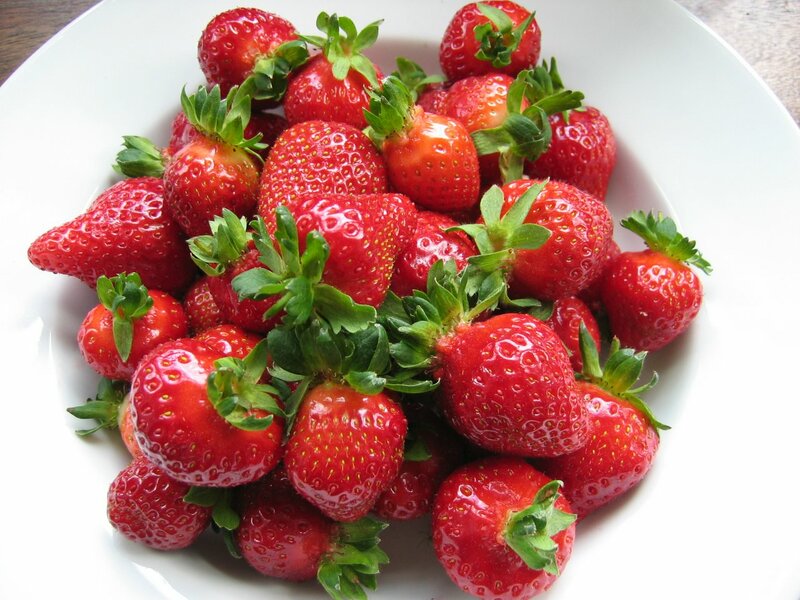 Summer is definately here, but the strawberry pick your own time (here in Scotland) is not quite upon us. We should be out picking our own at Lowes farm by the end of June…more about that when the time comes.